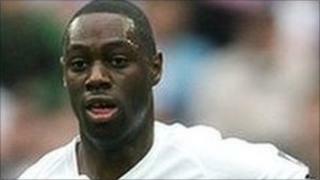 Tottenham and England footballer Ledley King has been banned from driving after he was caught speeding. King, 30, of Cuffley, Hertfordshire, admitted breaking a 70mph limit as he drove a Mercedes CL on the A14 near Newmarket in Suffolk on 29 June. He argued he had been travelling at no more than 95mph, but Sudbury magistrates ruled the police speed gun reading of 105mph was accurate. They banned him from driving for 56 days. King was also fined £800 and ordered to pay £250 costs. King also admitted the Mercedes had tinted side windows which allowed an "insufficient transmission of light" and was fined another £100. Prosecutor Lesla Small said King was clocked on a dual carriageway with a 70mph limit at Exning shortly after 2200 BST on 29 June. She said police had noticed the car's tinted windows after stopping King. Phillip Lucas, defending, said the footballer had six penalty points after he was twice clocked travelling "moderately" over 30mph limits in 2009.